To most people, chain link is chain link. But here at Metro Fence, we know there really is a difference. That's why we carry only the best product available. Most chain link looks the same... at first! But after a while inferior material begins to deteriorate. 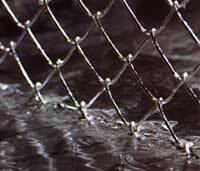 The lower tensile strength of substandard chain link means it is more easily bent and damaged. 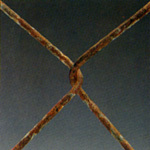 Inferior coatings allow the chain link to rust and corrode... sometimes after just a short period of time! The galvanized coating hasn't protected the inner metals, and the fence begins to show the signs of stress and weathering. The hot dip galvanizing process ensures a heavy protective zinc coating on all surfaces of your chain link fence, even the cut ends. Our chain link lasted more than 5 times longer before showing first signs of red rust. ASTM B-117 by United States Testing, Inc. Comparison after 96 hours of concentrated salt spray testing. United States Testing, Inc.
GAW Chain Link Fencing! Leaves the competition in the rust! 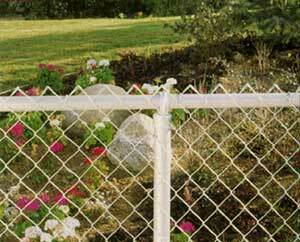 Many many manufacturers make their chain link by galvanizing the wire before it is woven into actual fence fabric. This fencing, referred to as GBW (galvanized before weaving) is generally manufactured to the least demanding specifications, with little thought to the product longevity. In compliance with the American Society for Testing and Materials Standards, our product is galvanized after weaving (GAW). This ensures the steel base is completely coated with up to five times the amount of zinc. Through a special process, the extra vital zinc adds only a fraction to the actual cost of the fence, but ensures that your fence fabric will last many times longer than our competitors' typical commercially coated GBW fencing. *Our GAW fence fabric meets or exceeds the American Society for Testing and Materials standard specification for zinc-coated steel chain link fence fabric (ASTM A 392) for gauges and size of mesh specified.